The best ideas for fixing the Oscars from Slate readers. 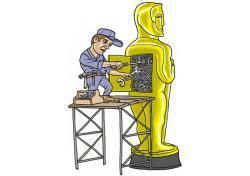 Presenting the Slate master plan for fixing the Oscars, courtesy of your best Hive proposals. After 115 proposals, 800 votes, and much spirited debate about what the Oscars ought to be and why we watch them, we’re proud to announce the Slate master plan for fixing the Academy Awards. It’s a mix of proposals from Slate readers—including the two highest vote-getters—and writers, plus one bold idea that takes a reader’s wild notion even further. The proposals tackled three separate problems, and we’ve cherry-picked the best ideas regarding each for our master plan. First, many people addressed how nominations work—and why they neither reward the best movies nor the movies people care about most. The second problem is the lousy acceptance speeches: What should be highlights of the show are nearly always anti-climactic. And finally, many proposals attempted to rid the Oscar telecast of its stodginess by injecting actual drama and fun. So let’s solve each of these problems! 1. How to make the nominations better? Separate best picture and all the acting categories into Drama and Comedy, and Institute term limits on academy members. Instead of up to 10 best picture nominees, hardly any of which are funny—because the Oscars hate comedy, even though audiences love it—how about five dramas and five comedies? (The first to propose this idea was user ChipG.) It works like a charm at the increasingly popular and way more entertaining Golden Globes. And if they’d done it this year, great (and popular) movies like Bridesmaids, 50/50, and Rango might have gotten best picture nods. Those movies could have joined The Artist and Midnight in Paris in the comedy category, leaving five slots for great dramas in the drama category. And splitting the acting categories allows more stars to have a stake in the awards—which would make the ceremony a lot more thrilling. But what about the academy’s terrible old-person taste? Easy: Institute term limits, as proposed by user mchasewalker. If you haven’t been directly involved in making a movie, no matter how small, in the past five years, you’re out. The academy’s average age would drop 10 years in a flash—and I bet it would get less white, less male, and more hip, too. 2. How to improve acceptance speeches? Institute “the scroll.” This idea, first proposed in the Hive by user Jon Sternfeld, requires each nominee to submit, in advance, a list of all the people she wants to thank should she win. When Jean Dujardin’s name is called, then, he can take the stage confident that his agent, mother, and favorite croissant-baker will be thanked in text rolling underneath his handsome face, and he can concentrate on giving a fantastic speech about how he owes it all to Uggie. 3. How to make the show itself more dramatic and fun? Simple. Take a page from reality shows. We were inspired by proposals from Rick, Rabbit Ears, and Everett to make the Oscar telecast a grand live competition in which actors, directors, and other nominees justify their nominations. Actors can explain what made their roles so interesting and give us a glimpse into the craft. Directors could actually direct parts of the Oscar ceremony. And nominees could come onstage to face elimination, American Idol style. But we wanted to go even further. And then it hit us: Why on earth do academy members vote a month ahead of the Oscars? Shouldn’t they vote live? Wouldn’t it be more fun to make the Oscar ceremony itself the referendum on who deserves the award? Academy members would still watch all the nominated films before the ceremony, but voting would occur online and by phone during the telecast. After the five best actor nominees strut their stuff, for example, academy members could vote for the category en masse; if the Idol computers can handle 580 million votes, the academy’s can handle 5,765. Does this reward smooth-talking directors over ones who sputter and slur? Does it reward handsome actors who can charm the audience in person? Of course it does. But academy members can still vote for whomever they want; if they love a movie, they can vote for it whether it’s well-represented on Oscar night or not. Nevertheless, for us—the viewers watching at home—the show transforms from a ceremony giving awards to movies we haven’t seen to a live competition rewarding both filmmaking prowess and live flair. Thanks to all the readers who submitted proposals, voted, and commented. We’ll pass the Slate Fix the Oscars Master Plan to the academy. When all these ideas are instituted next year, and the Oscar ceremony goes from boring to splendid, you can all claim a little bit of the credit.